So, it’s the weekend, and in between gearing up for some sleety, icy weather, we are going to check on a lone Canadian Goose that has been hanging around a McDonald’s parking lot in the next town over. The goose won’t fly, and he has been sleeping next to the parking lot black-top for a while now. He gets so close that you can touch him if you want, but his impressie size and loud hissing tells us not to do that. Is he ill? Not sure, so we call a Wildlife Rehabilitator. Can we get a picture of his poop? Apparently, you can tell a lot about the health of a goose by his excrement. The picture is inconclusive, but it’s a little darker than it should be which could mean lead poisoning but it could mean nothing at all. Here is what we know: The poop is slightly off color. The placement of the wings and shoulders are intact, meaning there is no structural reason why this goose cannot fly. He is eating the corn and lettuce we put out, so appetite is good. Although he is hanging out in one spot, he’s up, walking and hissing if we get close enough, so he’s feisty. It’s troubling however, that the goose remains in one area and does not fly or walk far away even when approached. So now the weather is changing to colder, and soon we will have sleety rain that is scheduled to ice over, prompting warnings of an ice storm. If the goose needs attention, we are told it’s best to capture him now to avoid him being in the harsher elements later. 911 and Animal Control state that they will come, but they will kill the Goose instead of trying to help us rescue him. What?! And it’s cold and wet, and there are not many people out, and those that are do not want to help round up a Canada Goose (we asked a few). So, the Wildlife Rehabilitor suggests that we try to throw a blanket over him and place him in a large box so we can bring him to a wildlife rehab facility over 30 minutes away. All this, and we still need to get gas for our generator and finish shopping before the harsher weather hits. For those that know me, you know I go to any lengths to rescue any animal in need. This Canada Goose situation is no different. So, my husband and I are at McDonald’s, each of us on one side of this Goose, trying to get closer enough to a now-mad bird, to be able to grab him in a blanket. It would be hysterical if it wasn’t cold and wet, and if we were better dressed for catching a Goose in the elements, and if we weren’t tired from running alongside him for half an hour. And then a guy comes over to find out why we are bothering a protected bird. I love him! We need more people to ask those concerned questions when they see someone doing something to an animal. We explain what we are trying to do. 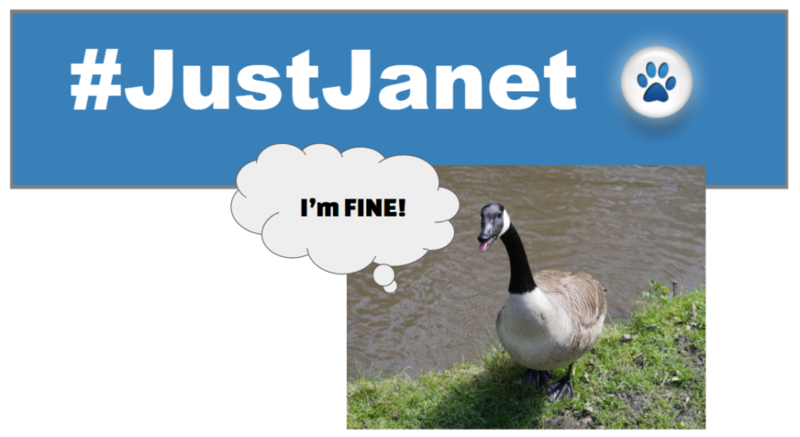 Then he says, “this goose is fine“. Him: “He’s got a female on a nest next to the building“. We call the Wildlife Rehabilitator back, and he laughs and laughs. He never thought to tell us to look for a nest site. Hubby and I look at each other, and we laugh and laugh. It’s a relief that the goose is not ill, and now we can go finish our errands without worrying any more about this bird. Lesson? Not every animal we see needs to be rescued. And with Spring now here, that is especially important to know because soon there will be babies. Baby birds, baby deer, baby skunk, baby rabbits – well, lots of babies. It’s important that we all follow the “look but don’t touch” rule unless there is a true reason to do so. Yes, there are times when it’s important to rescue right away, but there are other times when it’s good to observe first, and then make the decision to help. We would have hated to think how it might have turned out if we had captured that goose, brought him to the wildlife rehabilitation center and left his mate unprotected. The BEST part of this story is that everything was FINE. And the goose that didn’t need rescuing – we left him right where he was first spotted. If YOU see something – Go Help. Sign up for Just Do News! What is your JUST DO SOMETHING moment today? Click HERE to tell us!